When it comes to improving the food on today's hospital trays, some medical institutions are finding that onsite farms are the next logical step. This summer, St. Luke’s Hospital started sending all new moms home from the hospital with a basket of fresh produce, recipes, and literature about the importance of a healthy diet. All of the produce in the basket was grown on an organic farm on the hospital’s Anderson campus in Bethlehem, Pennsylvania. The hospital—part of a six-campus network—has been running a farm on the 500-acre grounds since 2014. “Our mission is to provide great healthcare and part of that is educating patients about the benefits of a plant-based, organic diet,” explains Ed Nawrocki, president of the Anderson campus. “One of the best ways to do that is to lead by example and show them how delicious produce grown on our farm tastes. But it’s not just new moms who benefit from the hospital’s bounty. In its first season, the farm at St. Luke’s grew 12 varieties of vegetables on five acres, producing 44,000 pounds of produce that was served to patients, incorporated into the cafeteria menu, and sold at weekly farmers’ markets on several hospital campuses. This year, the farm expanded to 10 acres and 30 varieties of fruits and vegetables. Mark “Coach” Smallwood, executive director at the Rodale Institute, the nonprofit organization that worked with St. Luke’s to help get its farm off the ground, believes there is a growing interest in serving organic, locally grown produce at hospitals. Some, like the University of Wisconsin Hospital, buy produce from local farms, others allow the community to use land on their campuses for community gardens. Now, a few hospitals are taking the next step, starting farms on hospital campuses. Among them are Stony Brook University Hospital on Long Island and Watertown Regional Medical Center in Wisconsin. Both are now using produce grown onsite to replace fruits and vegetables that are packaged and shipped thousands of miles before reaching patients. St. Joseph Mercy Ann Arbor Hospital in Ypsilanti, Michigan, planted the first crops on a 10-acre onsite farm in 2010 after patient satisfaction surveys revealed a demand. 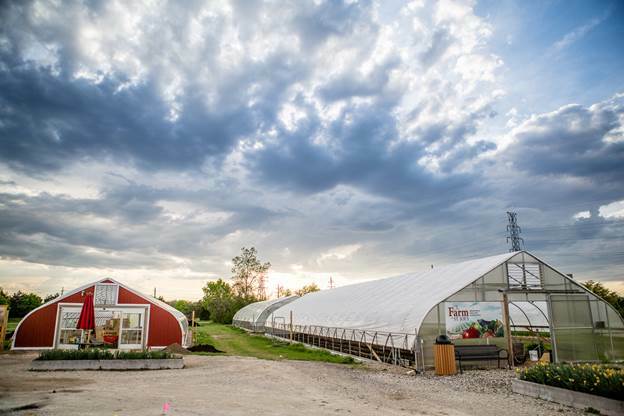 Over the past five years, the farm has grown to 25 acres, three hoop houses and four beehives. The farm grows fresh spinach, garlic, basil, collard greens, and strawberries. While farm-to-hospital efforts have been well received by patients and created PR opportunities, operating a hospital-run farm is not without its challenges. For starters, administrators are experts in healthcare, not agriculture. To help launch its farm, St. Luke’s partnered with the Rodale Institute for assistance in creating and implementing a plan, hiring a farmer, and managing operations. At St. Joseph Mercy, the hospital invested $32,000 in two hoop houses, hired a full-time farmer to manage farming operations for the 537-bed hospital and relies on interns and volunteers to handle most of the labor. It took a $125,000 capital investment to start the farm at St. Luke’s and, after two growing seasons, the farm is operating at a loss (with a goal of breaking even in 2016). The reason: Growing organic produce on the farm is more expensive than purchasing it through a food service supplier or sourcing it from local farms. But Nawrocki still champions the idea, explaining that encouraging patients to eat healthier diets now could improve their health in the future. In addition to the capital investment to start farms, hospitals that want to serve fresh produce must invest in recipe development and training food service workers to transition from heating and reheating prepared foods to making dishes from scratch. In the future, the hospital hopes to partner with a local culinary program, using interns to offset the additional labor costs and make its hospital farm cost neutral by 2020. Smallwood admits that food service staff is often resistant to the changes, which create additional work; hospitals that contract with external food service providers face the additional obstacle of needing to get buy-in. It’s not just the behind-the-scenes issues that can stymie efforts to grow and serve fresh produce. Convincing patients to trade comfort foods like mac and cheese for whipped turnips and sautéed spinach can also be challenging. “Some people just don’t care,” Nawrocki admits. But, with the help of robust marketing campaigns and creative efforts, some hospitals are determined to help patients rethink their diets. St. Luke’s reduced prices at the salad bar by 25 percent to promote the farm’s produce; cafeteria sales are up 15 percent and, earlier this month, farmers’ markets at all six campuses sold out of produce. I would prefer to see them support and purchase from exsisting producers vs. starting a non profit farm. Change the economy through institutional buying. They even said their expertise is in healthcare, so buy from the expert farmers. That infrastructure money could have done amazing work for local exsisting producers! How wonderful! You should have small classes for tips on growing food. Does this program make use of volunteers? I am passionate about the food served in hospitals and love what you are doing!!! I lost a sister to cancer 4 months ago and to see the food the hospiyals served her was disheartening. If there is anyway I can help out, I would love to be apart of this powerful movement that can help heal our disease from the inside out. Please email me and let me know I how I can contribute. Keep up the good work. Thank you for all that you've done!!! This is a step in the right direction, teaching early eating habits on good food. we would love to Duplicate this Model in Canada! Would love to get involved in something like this, do they need any volunteers or assistance? This is really wonderful. That's a blessing if your in hospital your fed fresh food, to help speed recovery. And organic!!! Great idea!!! THR needs to start something like this. Community gardens are big in the DFW area, and so are Farmer's markets. We could certainly be ahead of the curve in this marketplace if we jumped on this band wagon. Great PR! Great draw for employees and patients. I'm sure they could partner with all kinds of other organizations for volunteer labor, and incorporate it into our Community Time Off initiatives. Don't think they could lose with a program like this. I am ever so hopeful that this venture exceeds all expectations and that the trend towards eating organic, locally sourced food keeps on GROWING. Everyone needs to understand what they eat is what they are. I am the coordinator of our local school garden and my goal is to get kids enthused about growing food and loving what they grow. It has become a very popular program over the last nine years. Fantastic operation, keep it up and expand as you can. Keep it going as you can for good health forward. Really great idea!!! I've worked in healthcare for 15 years and the cafeteria has always been suboptimal. Especially for evening & night shift employees; they tend to get left overs and fried foods. I'm forwarding this article to our director at St. Luke's in MO! It's a long shot but the area where our hospital is located is upscale and a lot of the community eats healthier! Thanks for the info! I think it is great that hospitals are taking a more conscious role in the food that they feed the patients. Like Hippocrates said: Let food be thy medicine.